Two sunsets in one week? Two sunsets in one week! This is like three months photographic output at my paltry 2018 pace. Photography has been on the back burner this year yet I am keen to get back on the fire. As it was earlier this week, I made a last minute 8:00 p.m. decision to drop the apathy and get out to the marsh. Standing in my driveway I saw Mammatus clouds were setting up over head. It looked to hold through sunset. To my gear I bolted. From there it was the usual drive out to Cedar Run Dock Road. Engaged in rapid knee bouncing to exercise the am I going to make it in time? low grade anxiety. I arrived in 12 minutes in a world of peak green. 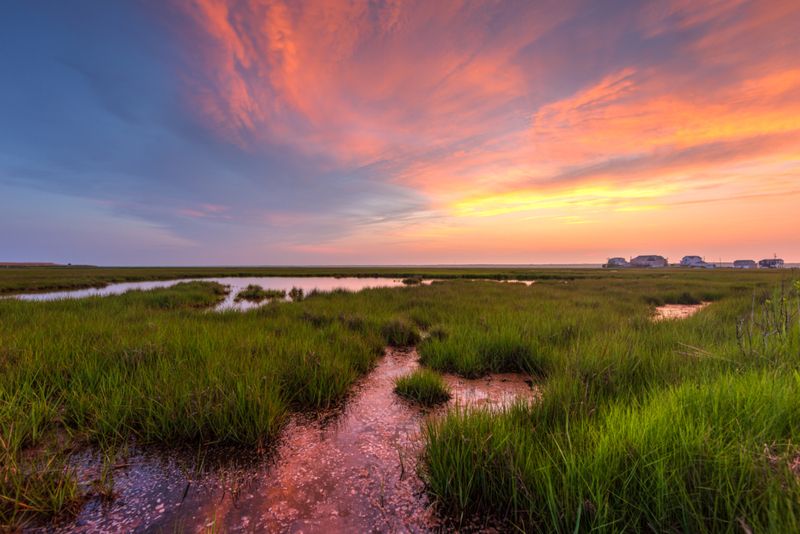 At a salt marsh imbued with the emerald glow of life and energy. Nothing beats it when a pastel sky sets up over top casting a subtle pink veil over the sea of green landscape. Especially when the pink tones reflect powerfully in the small pools of brackish water cutoff from the main estuary flow. The pink and the green compliment each other so well rendering a scene made to transfix. Getting back into the sunset flow and returning to the basics that brought me this far I set up low on the marsh. Tripod and camera a little more than a foot above sea level, nestled in a patch of eel grass. Once I’m dialed in it is little more than bracket city from there—making exposures and day falls to night. The fire is back and the pace will quicken.